A term “continent” is known to be referred to one of the several large landmasses on Earth. It can be generally identified by convention rather than any strict criteria. There are seven commonly recognized as continents areas: Asia, Africa, North America, South America, Antarctica, Europe, and Australia. The geological process and study of the collision, division, and movement of continents is known to be called as a “plate tectonics”. It can be tracked on the maps which may be created in the ConceptDraw DIAGRAM diagramming and drawing software. Continent maps are one of the most widely used maps nowadays. They may be represented as either the aeronautical or the nautical charts, railroad network maps or hiking/bicycling maps going into more details after but, originally, they represent the general view on the continents from the space. Map-making is a popular study as well as a practice of crafting representations of the Earth upon a flat surface. Those who make such maps are called the cartographers and anyone can become a professional cartographer as long as they have both ConceptDraw DIAGRAM and the Continent Maps solution to create the unique drawings by editing the pre-made ones. The Continent Maps solution offers the pre-made samples and templates of the continent maps that may be used as drafts for creating the unique as well as the professionally-looking drawings. There are also the stencil libraries full of vector stencils available for all the ConceptDraw DIAGRAM users to be used for drawing the Continent Maps. Creating African, Asian, Australian, European, and North and South American geographical maps, cartograms and thematic maps in order to assist with visualizing the business and thematic information connected with geographic areas, locations or customs has become much simpler and it is possible to do for any ConceptDraw DIAGRAM user regardless their profession or field of business activity they are involved in. 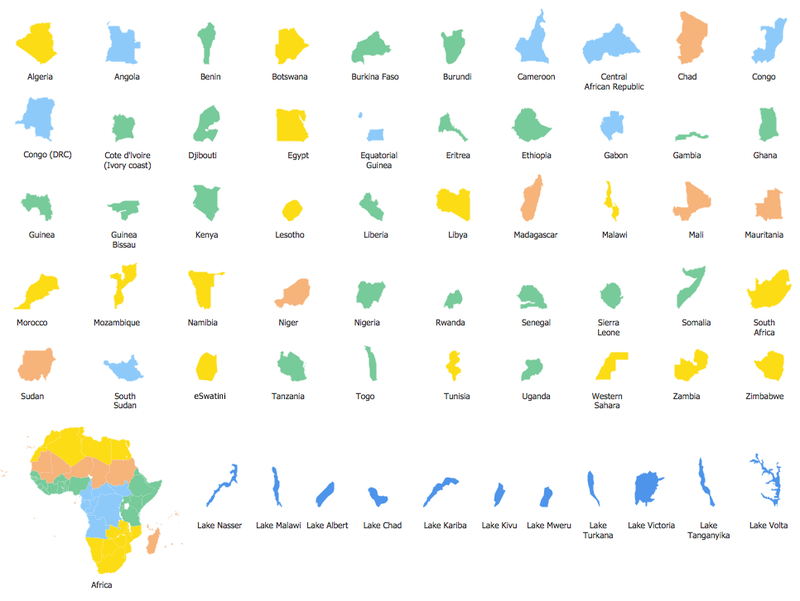 There are 13 libraries containing 677 vector objects in the Continent Maps solution. 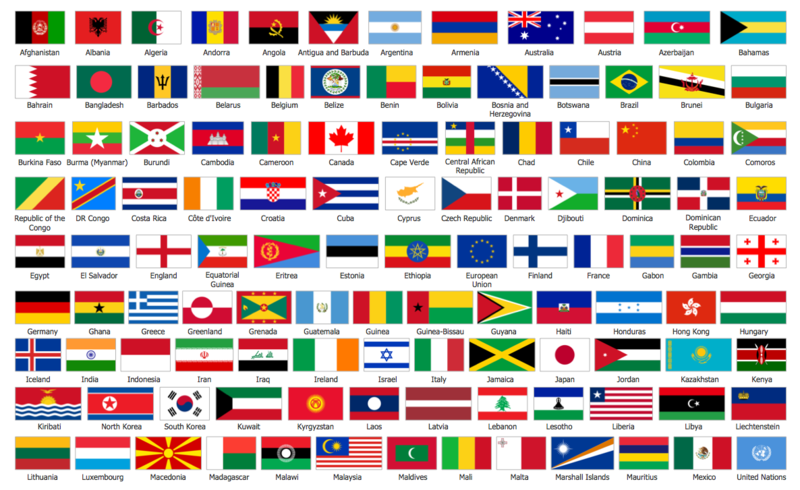 There are a few samples that you see on this page which were created in the ConceptDraw DIAGRAM application by using the Continent Maps solution. Some of the solution's capabilities as well as the professional results which you can achieve are all demonstrated here on this page. All source documents are vector graphic documents which are always available for modifying, reviewing and/or converting to many different formats, such as MS PowerPoint, PDF file, MS Visio, and many other graphic ones from the ConceptDraw Solution Park or ConceptDraw STORE. The Continent Maps solution is available to all ConceptDraw DIAGRAM users to get installed and used while working in the ConceptDraw DIAGRAM diagramming and drawing software. This diagram was created in ConceptDraw DIAGRAM using the Europe and Europe Flags Libraries from the Continent Maps Solution. An experienced user spent 15 minutes creating this sample. This sample contains a geographical map of Europe with European countries state flags. ConceptDraw DIAGRAM, enhanced with the Continent Maps Solution gives you the perfect set of tools to draw professional-looking political map of continents, countries, or even a 7 continents map in just minutes. This diagram was created in ConceptDraw DIAGRAM using the Asia Library from the Continent Maps Solution. An experienced user spent 10 minutes creating this sample. This sample demonstrates an Asian continental map. It is useful for the visual representation of geospatial information, statistics, and quantitative data relative to Asia. All Asian countries are designated on this map. ConceptDraw DIAGRAM allows you to make the maps with any level of detail – from world continents map to maps of specific cities. This diagram was created in ConceptDraw DIAGRAM using the Australia Library from the Continent Maps Solution. An experienced user spent 5 minutes creating this sample. This sample visualizes time zones in Australia. Use colors to help additionally illustrate and annotate your continental maps, and continent and ocean maps. Colors are also an easy way to mark important moments. This diagram was created in ConceptDraw DIAGRAM using the Canada Library from the Continent Maps Solution. An experienced user spent 10 minutes creating this sample. This sample shows Canadian political map. High resolution vector illustrations created in ConceptDraw DIAGRAM are perfect for presentation needs. They scale properly for large screens. This diagram was created in ConceptDraw DIAGRAM using the Europe Library from the Continent Maps Solution. An experienced user spent 5 minutes creating this sample. This sample illustrates a European continental map with highlighted group of countries: EU members, NATO members, EU and NATO at once members. The legend explains what each color means. Both ConceptDraw DIAGRAM diagramming and drawing software and the Continent Maps solution can help creating the illustrations you need. The Continent Maps solution can be found in the Maps area of ConceptDraw STORE application that can be downloaded from this site. Make sure that both ConceptDraw DIAGRAM and ConceptDraw STORE applications are installed on your computer before you get started. After ConceptDraw STORE and ConceptDraw DIAGRAM are downloaded and installed, you can install the Continent Maps solution from the ConceptDraw STORE.